The Outfoxed gals commit journalistic perjury again, yet credulous dupes still believe them! With J$P Video! Updated! What follows is an object lesson. How people who cry "liar!" are in fact the ones telling lies. How the haters will employ every shoddy propaganda technique at their disposal to smear Fox. And how there are no cretins more gullible than the ones who swallow the drool that drips from the newshounds (another fine product from the Outfoxed mob). The panel also has been hearing from former Army Pvt. Jessica Lynch. She said she's trying to set the record straight about her dramatic rescue from Iraq. Now to increase the paranoia among the credulous, the biased bassets explain the secret agenda behind this spiking of a major news story. You see, the Lynch situation hasn't been well publicized (! ), and "Fox would like to keep it that way, thank you very much". Why? One of strongest points Lynch made today was that the "dramatic rescue" itself was one of the government's lies, yet a Fox "News anchor" promoted and repeated it. Apparently Fox thinks George is in enough trouble as it is. Fox News spreading lies...who would have thunk it. Yeah, I remember the "dramatic" rescue. When I heard about it, the first thing that came into my mind was, "Wag the Dog." This is a clear example of how Fox News lies in its coverage. It's interesting how Fox mentions the story - but doesn't go into detail. And if you watch, Lynch's testimony will get coverage on CNN & MSNBC, but it will be completely ignored on [Fox]. What have we here? It appears that the Lynch appearance was covered fully during each of those hours. Not just a summary, but full, live reports, complete with clips of her testimony. All of these aired before Melanie posted her smear. And there were more as the day wore on. But somehow, Mel skipped over 12:00 pm, skipped over 1:00 pm, skipped over 3:00 pm (all hours that the hounds cover regularly--but didn't this day), and only mentioned the 2:00 pm report. Why do you suppose that is? Hmmm? Apologists for Fox haters in general, and the newsliars in particular, are going to have their hands full defending this one. Let them try. 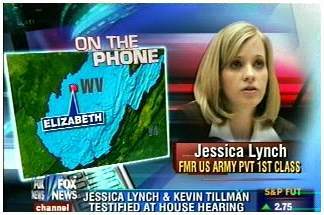 Update: The Fox cover-up of the Jessica Lynch story continued the next morning. Ms Lynch was interviewed on Fox & Friends. Way to keep the story secret! Yes, the newsmutts wrote an article on the show. And no, they made no mention of the Lynch interview. Now they can have the head commie piggy blog for them since she's looking for a new venue to snort her American hating venom. Rosie and gang. The piggy and the ankle nipper's, what fun that would be for us. Did you notice the commie code pinko's sitting behind Lynch and Tillman's brother when they were giving their testimony? Those dem's let any little communist in during investigation's don't they? I'm not sure if they're commies, but the mutts sure do practice the same brainwashing of their subjects. I'd say it's sad but their followers willingly allow it to happen. We should pity them. Be careful Fox Fan! Showing pity to some of the poodles could be just like showing your hand to what you think is a friendly snake! This comes from a once commited leftist. And okay Johnny, I can't help myself. But as Johnny Carson would say. How wildly off topic was he? Not sure if they're commies's, Fox Fan? Google the head Commie Code Pinko. It will remove all doubt. Also take a look at how many times this head commie pinko has been arrested on OUR property. One must wonder if a "neo-con," as the brainwashed like to call those that disagree with their communist aka socialist policies wopuld have been allowed in after being arrested countless times for disrupting and harrassing one of those Schumernut's or Clintoncommie's hearing's or SOTU speeches. By the way did Chelse get a brain and become a Republican since we have seen nothing of her with Mommy Dearest? WHAT? I'm talking about the code pinko's that were at the Lynch, Tillman hearing. Unhinged? The only one "unhinged" here is you. Read and understand a post. Must have taken a few days off from watching Fox and went to A-RACIST-NBC and lost your reading and comprehension skills. Now get back to watching Fox and be a true FOX FAN. "What folllows is an object lesson. How the people who Cry 'Liar!' are in fact the ones telling lies? By this logic you are a complete and total liar Johnny. What lies would those be that I've told? Gimme a couple of examples. "What folllows is an object lesson. How the people who Cry 'Liar!' are in fact the ones telling lies?" This is your statement is it not? I'm just following its logic. You do often call others liar. By the above logic that would make you one. Oh and you do seem to routintly claim the KO lifts his stories from blue blogs but the only evidence I've seen you present is that blueblogs are running the same or similar stories... This is an example of either poor reasoning, lying, or to be fair haven posted additonal evidence of which I'm not aware. if that is the case I'll retract this claim with an apology. But ou'd still be guilty by the above logic. You're not following logic at all. I didn't say ALL people. You do understand the difference between "people" and "all people", do you not? I take this as an admission that you haven't found any lies to point out. I've got over 800 posts on this blog. I guess you gave up trying to find all those lies. "You're not following logic at all. I didn't say ALL people. You do understand the difference between "people" and "all people", do you not? People: human beings, as distinguished from animals or other beings. b) Johnny Dollar is Liar. C) I don't understand logic. "I take this as an admission that you haven't found any lies to point out. I've got over 800 posts on this blog. I guess you gave up trying to find all those lies." You took it wrong I have not read all your posts but instead a few and found you claiming that keith lifts his sources from blue blogs without evidence other than a coorilation of stories(at least in the post I saw) meaning you are intentionally misleading people into thinking you have suffcient evidence to back up your claim. I'd call that a lie. If you have further evidence I'll withdraw my claim that you are lying on this matter and conclude you ar a liar by your own logic. I cannot be a liar if what I say is true. Can you prove what I say is not true? That would be your first task if you wish to accuse someone of being a liar. You made a charge, it is up to you to back it up. If you can. By the way, we have a policy here. Relevance to the subject matter of the thread. And no name calling. You are straying far from both. So be careful on that. Consider that a warning. "I cannot be a liar if what I say is true. Can you prove what I say is not true? That would be your first task if you wish to accuse someone of being a liar. You made a charge, it is up to you to back it up. If you can." You are only a liar in this case if and only if, your reason is "b" ( I'm inclined to beleive this is the case but i could be wrong). If it is "a" for example you are merely making an easily correctable logical fallacy which I'm sure you will fess up to and correct. If it is "C" then I'm sure to clear your name you won't find it too much trouble to mention the addtianl information you have. I'm easy i can look for it myself, just simply name the proof and after I find it I will apologize for the insinuation. So which is it Johnny a, b or c? "By the way, we have a policy here. Relevance to the subject matter of the thread. And no name calling. You are straying far from both. So be careful on that. Consider that a warning"
I responded to a direct quote from your summery. You challendged me to name an instance of lying. (even though my statment had nothing to do with anything out side of the logic of your post) I indulged this an found (from another thread)what is either an instance of deceit or shoddy logic. So if I'm off topic it was in response to you. I also never called you a name but gave a demonstable example of why your logic is in the orginal summeray was incorect. it was snarky no doubt but so was your reply. so for that matter has pretty much any disagreement any have had with you. I'll stop if you will. But by all means if you wish to ban me or delete my post feel free. I waste too much time on these boards anyway. P.S. You would still be guilty of being a liar by your own logic unless you are willing to just concede "This goes to show people who shout 'Liar' are liars" is a broad genrallization that certainly does not always apply. Oh please. Didn't I state several messages ago that "people" does not mean "ALL" people? In fact the people it referred to were precisely identified in the article. You want to play this little semantic game you are welcome to do so. It's telling that you fall back on that but cannot rebut the arguments made in the article: that the people in question were in fact not telling the truth. I suppose it's SOP to divert into word games when you can't really debate the substance of the post. "Oh please. Didn't I state several messages ago that "people" does not mean "ALL" people? In fact the people it referred to were precisely identified in the article." "You want to play this little semantic game you are welcome to do so. It's telling that you fall back on that but cannot rebut the arguments made in the article:"
I'm taking the position that one shouldn't automatically assume that other watchdog groups are automatically wrong because you seem to have caught newshounds. "People" (regardless of who you meant) that call people liars has NOTHING TO DO with whether they are a liar or not. I'm making sure that your faithful readers don't come to hasty conclusions about an the validity of a critic on such faulty reasoning. I'll assume you did your research and are correct on the rest. btw, I don't want to get off topic, so let me know if i should just e-mail this to you. What is your prrof of the blue blog link? I am curious which of the three choices is correct? I would ask you to please be specific. Can you link to the quote that has you so perturbed so I can see it for myself? Good to see lies by the feminazi's at Newshounds exposed. I've grown tired of visiting that lame site and it's obsession with finding bias where there is very little. Blogging in general is a bit over rated so this will probably be my only post over here. Bye. One more think about Newshounds, if you're a man and exhibit some amount of testosterone, expect disdain from the PbD witches that post there, they'll pm each other and try to get you banned. I've seen this crap happen over and over at that horrible site.